The tools you use for your business are a key component in your success and overall efficiency. Learn why QuickBooks Desktop Enterprise is the smarter way to do business in this comparison infographic showing grid scores, ratings, and other helpful information. QuickBooks Online offers up many applications that integrate directly with QuickBooks and streamline processes for your business. Users aren't shy when it comes to rating the apps they use and Intuit's site shows the ratings for each app, out of five stars. If you are a small business that has used QuickBooks Online, or thought about using it, it’s worth understanding whether it is suitable for your needs, or if QuickBooks Online Advanced (QBO Advanced) would be the appropriate stepping stone for your business. What’s New in QuickBooks Desktop Enterprise 2019? It’s that time of year again; time to check out the latest version of QuickBooks and what it can offer you. 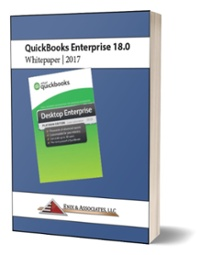 Here are some highlights that caught our eye in the latest version of QuickBooks Desktop Enterprise 2019.